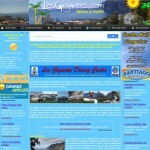 NEW Los Gigantes website 2012! Yes we have upgraded the whole website to PHP scripting language . Designed for Web development to produce dynamic Web pages. The website was designed and built to run on all major modern web browsers: Internet Explorer, Mozilla Firefox, Google Chrome, Opera, and Safari. The website is best viewed at a resolution of 1280 x 1024 but works fine on 1024 x 768. Over the next few weeks we will be uploading more pictures, vidoes and information so stay tunned!